The smokebush is known and named for thin inflorescence stalks that resemble clouds of haze after the plant’s flowers drop early in summer. 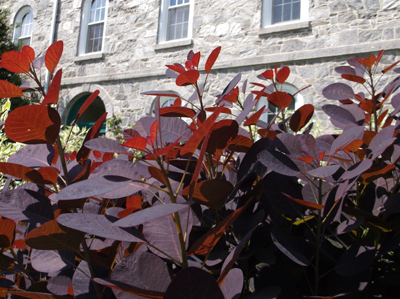 However, the smokebush east of Parrish hall is equally ornamental without its namesake. ‘Royal Purple’ features dark foliage that turns nearly black over the growing season. Common smokebush grows well in most soil types, but it needs full sun and good drainage. 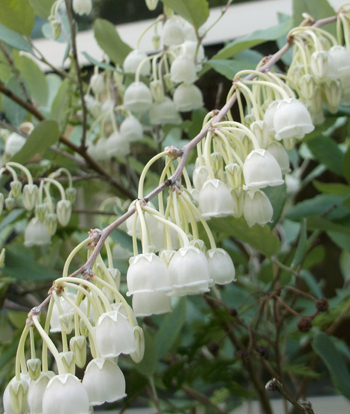 It blooms best with little to no pruning; however, hard pruning to three feet keeps it more compact and gives the new foliage a more vibrant color. From its appearance, you would think dusty zenobia was native to some ethereal fairy kingdom from children’s literature, yet it calls the southeastern United States home (and is also quite content in the Glade Garden). The pendulous, white flowers on white racemes, which bloom in May, might be the zenobia’s most spectacular feature, but this cultivar certainly provides multi-season interest. Its gray-blue foliage and arching branches stand out in summer, and reddish-purple fall color rounds out the year. Dusty zenobia prefers acid soil and requires even moisture, making it a perfect choice for moist spots in the garden. While fothergilla are usually grown for their fragrant, white spikes of flowers, and thus relished in April, ‘Blue Shadow’ brings much more to the table. This shrub maintains its striking blue foliage all summer. 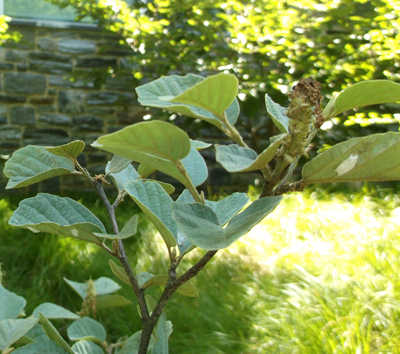 In the fall, this fothergilla’s witch hazel-like leaves turn various, bright shades of orange. It must be planted in acid soil, but it can tolerate some shade.